All Westampton Twp homes currently listed for sale in Westampton Twp as of 04/20/2019 are shown below. You can change the search criteria at any time by pressing the 'Change Search' button below. If you have any questions or you would like more information about any Westampton Twp homes for sale or other Westampton Twp real estate, please contact us and one of our knowledgeable Westampton Twp REALTORS® would be pleased to assist you. "Welcome to this distinctive stone front colonial located within walking distance to the Burlington C C. This house features five bedrooms 3 bathrooms, and more than its share of charm. Situated on a quiet cud de sac this home stands out with its curb appeal. Professionally landscaped provides you with some insight on what you can anticipate once you enter. After entering you see the expansive dining room to the right with the living room to the left, each with the solid oak hardwood floors that cover the majority of the downstairs. Walking to the back of the house, you have the gathering room with gas fireplace and sliders that provide access to the deck behind. Featuring both an office and game room on the first floor you have plenty of room to find a quiet spot. Now talk about entertaining, the kitchen with granite counters and bar seating overlooks the sunken breakfast room, with both cathedral ceiling and bay windows. Next to the kitchen with a separate access to the back yard is the laundry room with butler pantry. Upper level hosts five good sized bedrooms and a den off the master. The master is substantial with a cathedral ceiling. The master bath has a heated tile floor, skylight, and tiled walk in shower. In The basement has a Bilko door for access from the back yard. Two zone heating and AC. Among the updates are the following, new roof 2008, 3rd bathroom added 2004, family room slider and guest bedroom windows replaced 2013, hardwood floors 2008, 3 new sump pump replaced 2015, master bath remodeled 2012, new portico and front door 2012, new AC condenser main house 2015, new generator 2012, exterior door in basement 2011, kitchen upgrade 2007, chimney chase covers 2012, french drains 2006, other bathroom upgrades 2010, new kitchen appliances 2008, patio awning 2007, basement wall anchors 2018, fireplace surrounds upgrades 2010, paver walkway backyard 2005. Property located near Route 38, 295, 130 and New Jersey Turnpike." "Time to pack your bags! 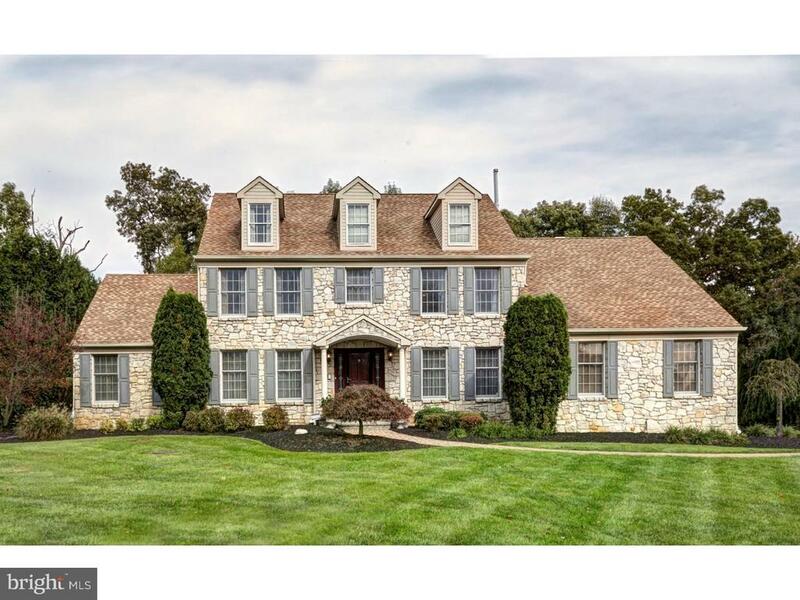 Welcome to this center hall colonial located in the Saddle Ridge Development in Westampton. Looking for space well you have found it here! Boasting five bedrooms, this house has everything for your growing needs. On just over an acre of land, you have the privacy needed to spread out, yet close enough to enjoy this great community. As you enter this house you will be welcomed by the detail given this house by the current owners. Hardwood floors in the foyer and up the stairs and throughout the entire upstairs. You will notice right away the expansive kitchen all set up for entertaining a large group of friends! Open to the stone fireplace in the gathering rooms or out the sliders to the large deck in the back of the house. Professionally landscaped really sets this house apart from the norm. With all the bedrooms upstairs it provides pleanty of privacy for everyone! The master suite is just perfect with a nicely detail master bath. Besides the great space on levels one and two is a full basement (partially finished with full bathroom). Located within minutes from the NJ Turnpike this house is close to all major highways, shopping centers. If you are a golfing fan, your just a stroke away! AGENTS SEE AGENT NOTES!" "Being sold as-is. Purchaser responsible for all permits, inspections, and certs. Affordable Housing Unit. Bank owned. Central air. Patio and outside storage area. Won't Last!!!"